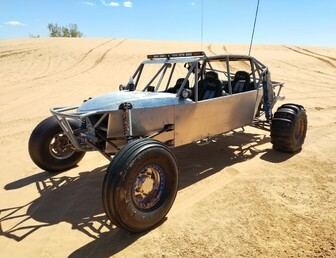 Similar to class 1 - built for sand and dirt. Unbelievable suspension with King Kong 4" and 2.5" Front with Bypass. Tig welded boxed arms, 1 3/4" tubing, fuel safe, radio, beard seats, etc. Car also has 5 speed Albins sequential with torque converter, 934-300m axles, full floater. Turn Key built motor - Kenne Bell Blower LS-7 HP 800+. Way too much to list. Complete car has been gone through; motor, trans, axles, cvs, batteries, brakes, etc. And car is set up to drive with hand controls for paraplegic. Wife drives car with ease! If necessary pedals can be installed. Car is ready for driver who likes to go fast through rough terrain and very comfortable with suspension!! Intellidash, recently gone through by intellidash. Located in Oregon, so serious inquiries only please. If you are a serious buyer, please email for more pics. Thanks. Org trailing arms, orig front arms, and an overly expensive set of narrowed front arms included as well. Full set of Crow belts/pads (black). These are used and way out of date for racing, but I've always stored them inside, so they are great for rec use. Loading wheels/tires/spares: One pair of near perfect Centerlines with barely used BFG Mud Terrains (33x9.50). Was going to mount those as spares as pretty light. Always stored inside. Also comes with a pair of beat to hell front Centerlines with beat to hell 7.00x15 tires (good for loading). A bunch of little goodies that aren't worth listing, but it all goes (CNC res rebuilt kick, some extra Crow belt parts still in boxes, extra CNC tall reservoirs, etc., etc.). Major parts alone total $17, 414 and that DOES NOT include the cost of the Desert Dynamics chassis, orig front dual sport arms, rear arms, or the various other nick knacks mentioned (such as belts, spare spindles, loading wheels/tires, rez rebuild kits, CNC clutch slave, this, that, the other and so on). In Oregon (east of The Dalles). If interested, questions, comments, etc., drop me an email please. PLEASE TYPE "DD" in the body of your email so I know you're legit and actually read the ad (I will not respond otherwise because of all the scammers). Also, due to all the scammers, I will not call you, hand out my number, nor respond to suspect emails. Again, the price is firm as this is a pretty big hit. I will delete ad when sold, so please don't ask. Thanks. 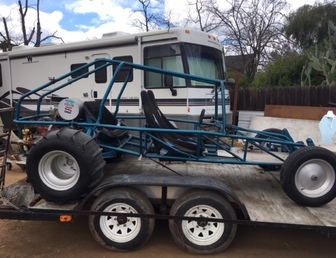 Willing to sell the chassis separate. 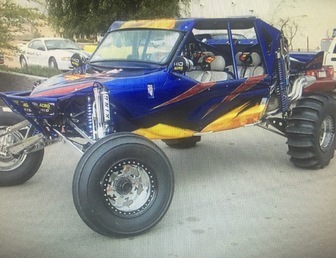 Chassis, full floor, trailing arms, orig front dual sport arms, heavy duty (narrower) dual sport front arms, new Kartek 2" spindles/uprights (shown), all FK heims, Kartek tie rods (for narrower arms). $7k firm. I will not sell other parts until/if chassis sells. Once the chassis sells, I'm willing to sell the remaining parts separately. *Transmission is a 6-speed sequential shift with race cut gears. *Clutch pack is new with heavier springs for the extra power. *Custom turbo exhaust and intake manifold. *Fox shocks on all four corners. *Powder coated frame and suspension. *Brand new paddles and front steering tires. *LED frond driving, rear tail, and whip lights. *Power commander Pod 300 programmable LED display. *Custom built Wing Trunk with storage. *New spare chain and sprocket.